The reality star is expecting her second son via surrogate. Kim Kardashian and Kanye West are expecting their fourth child, and they’ve been struggling to come up with a name for the little boy. The reality star revealed on Jimmy Kimmel Live! 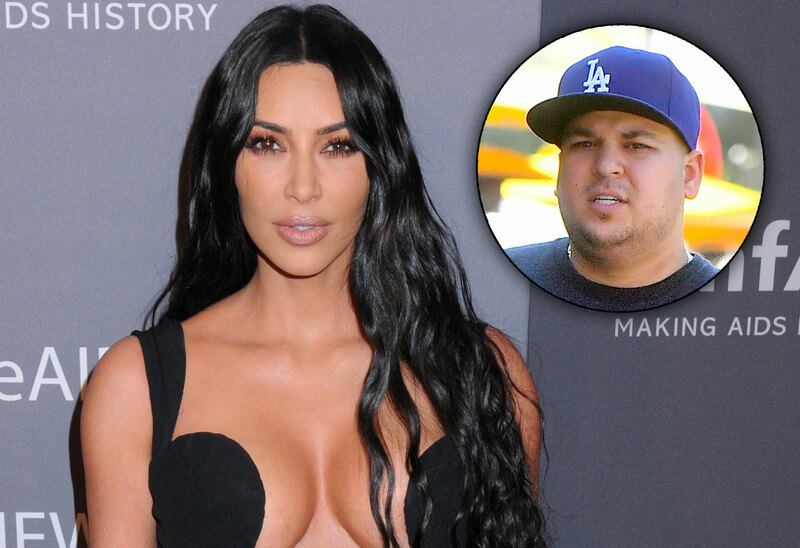 that the quest for a name has given way to one big frontrunner: Rob, after her brother Rob Kardashian. The news surprised fans, since Kris Jenner’s only son has been a bit of a black sheep with his sisters for years. Click through the gallery for find out why she’s thinking of honoring her brother in this major way. Kim, 38, was on the show with sisters Khloe and Kourtney. Jimmy, 51, wondered if she and Kanye were asking their family for help naming their fourth child, who they’re expecting via surrogate. The Keeping Up With The Kardashians star confessed that they usually do a family survey for suggestions, but not until after the baby is born. She revealed that her three kids — North, 5, Saint, 3, and Chicago, 14 months — had spent three to four days without a name while the parents picked one out. Kourtney, 39, even confessed that her son Reign, 4, had gone a full week before she and Scott Disick settled on a name. “One day, Reign, his name was Preston for one full day,” she said with a laugh. “I was like, ‘I know in my soul his name is Reign,’ and Scott didn’t believe me.” Scott eventually agreed Reign was the better name. Kim admitted her name search wasn’t going too well. “I was Googling Armenian boys’ names last night, and I couldn’t really find anything,” she said. “I was truthfully thinking about just naming him Rob, after my brother, Rob,” she revealed. Rob, of course, was named after their deceased father Robert. Her sisters agreed that “Rob West” sounded great, though, so it’s definitely still on the table as an option. Rob, 32, has stayed off camera for years, even though his sisters have begged him to change his mind. He’s currently living with mom Kris, 62, and they’re not getting along. What do you think of Kim naming her son after Rob? Sound off in the comments!